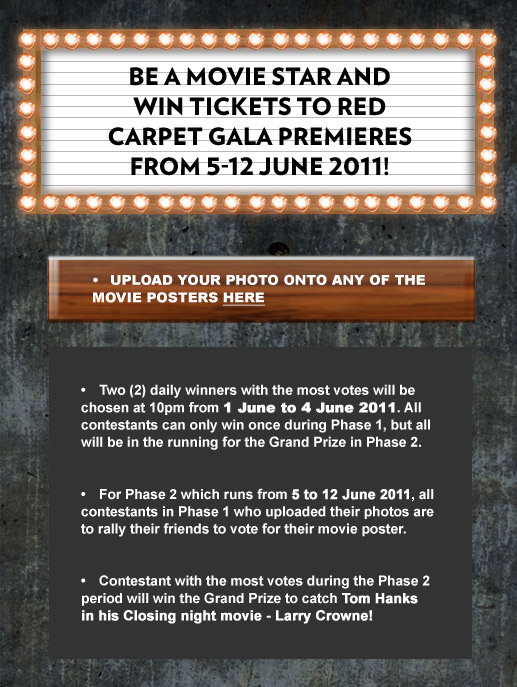 ScreenSingapore 2011 – Win Red Carpet Premier Tickets!! Movie buffs and those in the film industry….. ScreenSingapore 2011 is happening soon from 5-12 June 2011!! So excited…I have been invited to be a VIP at the event and I can’t wait to see what’s in store. ScreenSingapore will debut as an international cinema event offering policy makers, industry buyers, sellers, producers and creative talent from all over the world a platform to exchange ideas, business opportunities and showcase their product. Wanna Win Red Carpet Tickets To This Event?! Get the latest updates and have fun with their movie app on ScreenSingapore’s fan page where you can win free red carpet movie premieres as well as tickets to the exclusive preview of Tom Hank’s closing night movie, Larry Crowne! On top of winning movie tickets,you will also be updated on the latest stars attending and sneak previews of the movies shown on ScreenSingapore’s fanpage. ← Tried & Tested: Meet STRIP’s New Strawberry Wax..Made For Brazillian Virgins!